As we begin to understand that each of us is being called to raise our own consciousness, as well the consciousness of every other person on earth to a higher level, introspection will surely reveal that we first need to be on a steadfast path of spirituality ourselves, and then share our awareness with all those around us. Before we start disseminating our spiritual understanding, it is also very important to know where on the spiritual ladder we are, how far we have come, and how much further we aim to climb. The 8 fold path of Asthanga Yoga serves this aspect very well. Yoga means, Union with The Divine. In this system, there are 8 stages of evolution towards Enlightenment. One is considered to have evolved up to a certain level, if one imbibes all the qualities of that level 24 x7. 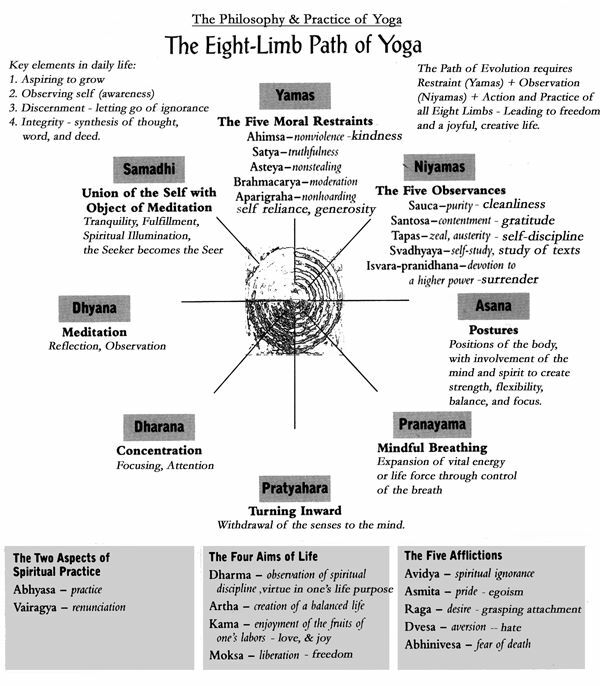 The 8 stages can also be considered as 8 limbs, so when one has to move forward, it cannot happen in a balanced manner if one of the limbs is weak. Therefore one must be aware of where they are weak and strengthen that aspect of themselves if they want to achieve Enlightenment. No doubt, it is a tough job in today’s world to be a focused and pure being all the time, but that does not mean we should reject systems that teach us purity by saying “Give me a system that suits Me!” We can instead imbibe tenets of a system to a level that suits our individual consciousness. Thank you for explaining things in so much of detail. It has helped me to expand my understanding of Yoga.